Grant Pyle's senior year began like most top athletes who are considering scholarship options at the college level. The Magnolia High School swimmer was ranked in the top six in Arkansas when a Memorial Day automobile accident shattered his dreams. Grant was the passenger in a vehicle where the driver was distracted by his cell phone and lost control of the car. The crash left Grant paralyzed. Grant spent three weeks in the Intensive Care Unit at Arkansas Children's Hospital in Little Rock in a medically-induced coma. During that time, his family learned that Grant would never be able to walk on his own, would likely never breathe on his own, and would spend the rest of his life in a wheelchair. It was a devastating blow to the family who had watched Grant, just two weeks into his senior year of high school, become one of the top swimmers in Arkansas. Grant spent a grueling four and a half months in ACH regaining his strength and learning to live again with no feeling from his chest down. He surprised everyone - even his doctors - when he began to breathe on his own with no medical explanation other than the huge lung capacity he had developed as a swimmer. Grant's senior year he spent Halloween, Thanksgiving, Christmas and New Year's Day in the hospital. His friends held on to hope, however, and Grant returned to join them at school finishing two classes and attend his prom and senior trip to Panama City Beach. Grant graduated on time with his class in May of 2014. His transition to life after high school was not easy. When Grant started occupational therapy and began feeling depressed and anxiety ridden, his aunt, Michele Paden of Mountain Home, researched the possibility of a service dog for him. She narrowed the search down to two service dog organizations, and then followed her intuition and submitted Grant's online application to Canine Companions for Independence. Within a couple of days, Grant's grandmother, Kathy Pyle, learned about a Marine Corps Reservist veteran from Walnut Ridge, Lance Weir, who had shattered his C5 vertebrae diving into a river, leaving him paralyzed. 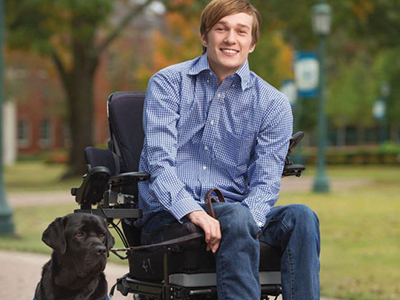 Lance was paired with a service dog through Canine Companions and became a spokesperson for the organization. After speaking with Lance by phone, Kathy was confident Canine Companions for Independence would be a good fit for Grant, too.